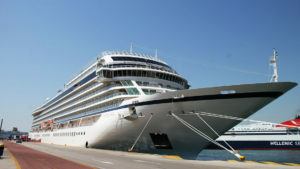 The cruise navigation is opened in the passenger port of St. Petersburg as of today. The beginning of the season was started by the chairman of the Committee on Transport Alexander Golovin and the general director of the Passenger Port of St. Petersburg “Marine Facade” Vadim Kashirin by ringing a bell. The first to enter the port was a Viking Sea liner. In 2017 the ship became the winner of the rating of the CruiseCritic Best Cruises Overall website according to passengers’ reviews. A total of 263 cruise ship calls are planned for navigation in 2018. In 2017 the port showed record results: it received 247 cruise ships and two ferryboats. The total number of passangers on board was more than half a million people.